Evangelicals stand divided in their view of women in the church. On one side stand complementarians, arguing the full worth of women but assigning them to differing roles. On the other side stand egalitarians, arguing that the full worth of women demands their equal treatment and access to leadership roles. Is there a way to mend the breach and build consensus? Sarah Sumner thinks there is. Avoiding the pitfalls of both radical feminism and reactionary conservatism, she traces a new path through the issues - biblical, theological, psychological and practical - to establish and affirm common ground. 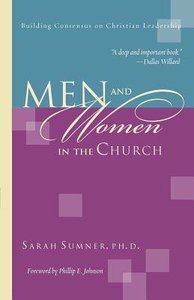 Arguing that men and women are both equal and distinct, Sumner encourages us to find ways to honour and benefit from the leadership gifts of both. Men and Women in the Church is a book for all who want a fresh and hope-filled look at a persistent problem. 332 pages, from IVP. About "Men and Women in the Church"
Sarah Sumner, Ph.D., serves as professor of theology and ministry, and as special assistant to the dean for strategic development in the Haggard Graduate School of Theology. She is the first woman to earn a PhD. in Systematic Theology from Trinity Evangelical Divinity School in Deerfield, Illinois. Her published books include Men and Women in the Church: Building Consensus on Christian Leadership (Intervarsity, 2003), Leadership Above the Line (Tyndale, 2006), and Just How Married Do You Want to Be? Practicing Oneness in Marriage InterVarsity Press, 2008). Dr. Sumner also serves as a regular teaching pastor at New Song Church in San Dimas California, and as an aerobics instructor at Bally Total Fitness. In 2007, she founded Above the Line Consulting and now travels internationally to do speaking and consulting. She has appeared on shows such as The Early Show for CBS News, and Lee Strobel's Faith Under Fire. Sarah and her husband, Jim, have been married for eleven years and are in the process of adopting an older child. 5. Is It Better To Be A Man Than A Woman? 11. What's A "weaker Vessel"? 14. How Does God Head Christ? 16. Does Matthew 18 Apply To Wives?